Here's a fashion spectacular you won't want to miss. The Dallas Fashion Show and Charity Ball 2013 is an event benefiting Dallas Fashions for Charity. The fashion show will feature designer Henny Hughes and the special host will be model/actress LeeAnne Locken. Unfortunately, I will have to miss it for my brother's graduation. 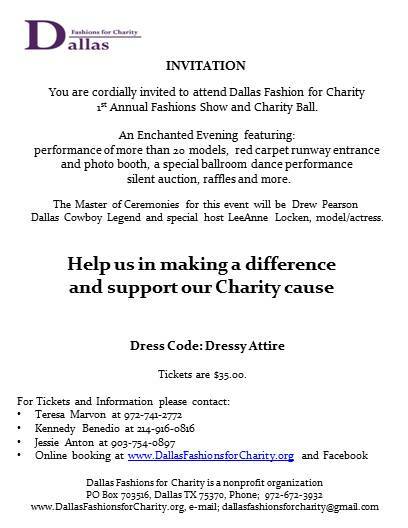 For more information on the event and to purchase your ticket, visit the Dallas Fashions for Charity website.